Clan Wars - is a browser-based multiuser politico-military game add-on to the MMO "World of Tanks"
Global Map - is the playing field for Clan Wars, divided by provinces. The basis of the Clan Wars game play consists of a strategic war, between players united into clans, to acquire and control territory on the Global Map. Troops participating in Clan Wars are represented with tokens, which are available to all clans participating in Clan Wars. The amount of these token available for a specific clan is determined by the number of members in the clan that have participated in at least one battle in any tier five vehicle or above. Every such player gives the clan one token, regardless of how many tanks he has played with. Besides tokens, clans also have their own headquarters, one per clan. The headquarters are a mobile capital of the clan and serves as a deployment point for tokens on the map from the clan reserves. Movement of your troops(tokens) on the Global Map is restricted to the commanders of clans participating in Clan Wars, and their lieutenants. The rest of the clan members can monitor deployments, troop movements and see their own clan headquarters. Also on the map they have access to information about planned attacks, their own, as well as the enemy's. Clan Wars game play is turn-based. Time on the Global Map is divided by periods of 60 minutes - a turns. 24 turns compose a game day. All changes on the Clan Wars playing field occur at the beginning of a new turn. At this time the actual movement of tokens and headquarters occur. For planned actions to take place at the beginning of the next turn, Clan Wars participants must complete their actions before the turn timer runs out. The playing field of Clan Wars consists of maps of modern Europe, North-Africa and North America, divided by provinces. Provinces are intended for deployment and movement of clan troops, practically, they play the role of a square on a chess board. A province can be neutral or belong to one of the participating clans. Provinces, belonging to a clan, bring a regular income in the form of game gold to that clan as long it is connected to the headquarters. Ordinary - These provinces comprise the majority of the map. They bring their owners a small amount of gold. Key - Income in these provinces exceeds ordinary by a couple of times. Starting - With the capture of these provinces a clan initiates their participation in Clan Wars. They bring their owners a small income. Starting provinces are always located on the coast or on islands and cannot be attacked from other provinces. They can be identified on the map by this element. Line of available reserves, showing the total number of tokens in the clan reserves. Information panel for the player's clan, and control elements which are only available to commanding clan members. Information panel for the selected province. Selecting a province can be accomplished by clicking on it with the left mouse button (LMB). Event log for the Global Map, which displays information about all events which occurred in the Clan Wars arena and are available for display. These events can be filtered by province or by clan, that is, to display events only having to do with a specifically selected province or only with your clan. To participate in Clan Wars, you must first create your clan and acquire at least 15 members, that give you playing tokens for the Global map. If you already have such a clan, enter the game portal in the Clan Wars section. There you will see a Global Map, which is the playing field for Clan Wars. 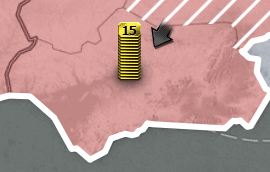 Under the Global Map you will see a line showing reserves, in which tokens are displayed in a row. This is the active reserve of your clan. Up until a request for a landing on one of the starting provinces it will display all of your troops, that is; all of the available tokens for your clan. To enter the war to divide the world, first you must capture at least one of the starting provinces. In the middle part of this window you can see the grid for the starting tournament; the current one or the recently finished, if of course, it occurred. On the left is a list of clans, that currently lay claim to the starting territory. To participate in the tournament and make a landing, you must press the button "Send Request" in the lower part of the window. You must also remember that, in a landing, only clan teams of at least 15 players can participate. If your reserves don't have that many free tokens you can't participate in the tournament for the starting province. After you sent the request and closed the window, don't forget to click on the accept button on the top part of the Clan Wars screen. Pressing this button is necessary to confirm any actions on the Global Map. 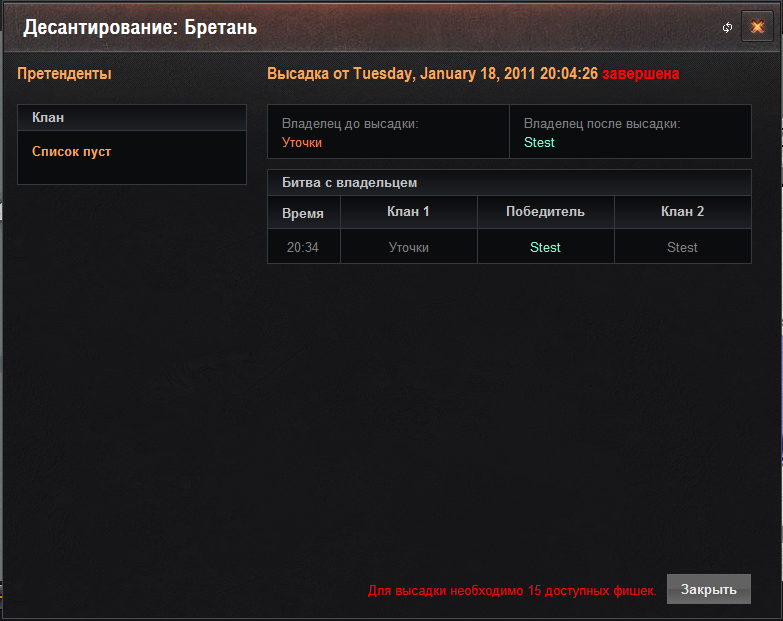 right after sending the request, 15 yellow tokens on will appear in a column on the selected starting province. That is your landing group, consisting of 15 troops. The yellow color symbolizes that you have the option to cancel the action and return them until the end of the turn. On the next turn the tokens will change to red. This color always symbolizes troops that cannot move. To find out when red tokens will be available for movement again hover the mouse pointer over them. On the tooltip will be displayed the number of moves that must pass for the tokens to be able to be moved again. For different tokens this penalty may be different. The formation of the tournament grid is done at the beginning of the first prime-time turn. You can see the prime-time for selected province in the right part of the province information panel. No more than 8 clans can participate in a tournament at the same time, not counting the current holder of the province. If you sent your request after the formation of the tournament grid, or, if before you 8 other clans already sent their request for the intention to hold a landing operation on this starting province, your clan will be put in a queue and can participate in, not in the current landing but, in the next. If the number of requesting clans exceeds 16, your landing will be on the third turn, etc. Number of requests on the selects province clans can also be seen in the information panel of the starting province. You can make as many requests for different starting provinces as you have available clan forces (with 15 players per landing) at the same time. Starting time for tournament, does not depend on the number of participants; they always begin at the same time - 30min after the start of prime time for the starting province. Time for the beginning of prime time is displayed on the information panel of the starting province. If your clan loses a battle for a starting province then on the next, after the loss, tokens for the participants in the failed landing will be returned to the clan reserves, and after one turn will be available for use again. Landings on a starting province from reserves can also be made after a clan captured a territory on the Global Map. Tournaments are arranged by Olympic system and consists of four rounds (1/4 final, semifinal, final and battle with current holder). In the event that in a tournament a clan is left with no competition it automatically moves to the next round. 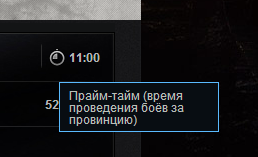 Tournament for starting provinces always starts at the same time - 30min after the start of prime time of that province. The time of the final battle with the current holders of the province depends on the number of rounds, that is, on the number of participants. Intervals between rounds are 30 minutes. If you managed to win the starting tournament and the battle with the current holder for the starting province then province becomes your clan's property. 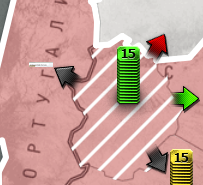 When your tokens on the conquered territory become green, you can move them to another territory. In order to accomplish a movement, you must select a province, in which the troops are stationed that are intended to be moved. You will see that this shows arrows pointing to neighboring provinces. The color of the arrows symbolizes the type of available movement. Green arrow points to a province belonging to your clan and allows a movement to the province without a battle. Red arrow points to a province belonging to another clan and means that you can attack this territory. Black arrow points to the territory, yours or other wise, to which movement is currently unavailable. Yellow arrow is used to return tokens to their original province from which they were moved in this turn. Also on the arrows may appear an icon of two crossed swords. It says that enemy forces from that province are already on their way to attack you and a movement towards them will result in a battle on the border of the two provinces. Troops can only be moved from a specific province one time in a game day. Moved tokens become unavailable for movement for the next 23 turns. Notice that you cannot move on province (your's or enemy's) more than 15 tokens, because according to the rules, more than 15 units form the same clan can't be on a single province. To complete a troop movement from one province to another you must click LMB on the appropriate arrow. One click moves one token. If you want to move the maximum amount of tokens hold Shift and click on an arrow. Having made all the planned moves don't forget to click accept button. You must give all the orders for troop movement and accept them with the appropriate button before the timer runs out and the next turn begins. Notice that tokens that were moved this turn are colored yellow. This means that until the end of this turn you can cancel the order and return the troops to their original positions. For this you must select the province on which the moved tokens are located and return them with help of the yellow arrow pointing to the territory from which they came. At the beginning of the next turn tokens moved last turn turn red. It means the a troop movements occurred, and it is not possible to move to another province for the duration of a game day. In the course of a single turn you can move tokens from a province and in their place, move, or deploy from reserves, different tokens. After the capture of at least one starting province you can place your headquarters on it. To do this operation select a province and press the button: (located on the lower part of the interface). Notice the yellow flag appeared on the province territory. It is the icon for your headquarters. Headquarters - its the mobile capital of the clan. Tokens that are in reserve can be deployed only in that province where the headquarters are located. You don't have a headquarters on the map. Not only can you move tokens out of reserve but also fill the reserves with them. To do this operation select the province, where your available(green) tokens are located and press the button in the lower part of the interface. Troops moved to the reveres will be unavailable for deployment for 24 turns. Notice that revered tokens change color constantly depending on how close the time for their deployment is. If you hover over one of the tokens you will see the turns left until their deployment. Deployed troops from reserves become available for movement for movement on the next turn after the deployment. The headquarters can be moved on the Global Map by the same rules as the tokens, that is only to neighboring provinces once per game day. Deploying troops and moving them in the same turn is not possible. If you moved the headquarters to another province then you can only deploy troops from there next turn. After your tokens have been been moved to a province not belonging to your clan, it becomes attacked and a battle is scheduled for that province. The same occurs for your province when it is attacked by enemy troops. On the Global Map provinces that are attacked are marked with a a special symbol, located on its territory. An attacked province is left available to conduct any operations (moving tokens in and out, deploying tokens from reserves, moving headquarters in and out of the province) until the beginning of prime-time. At the beginning of prime time such a province is blocked until the end of all battles for it, that is the block is removed at the beginning of the next turn after the end of the last battle turn. Starting province in which a landing is taken place is also blocked at the beginning of prime time. After the end of the battle for a province all tokens of the losing team are returned to the clan reserves. They remain blocked for the duration of a game day, that is they cannot be deployed on the map for the next 24 turns. A draw in a normal battle counts as a win for the defending team. 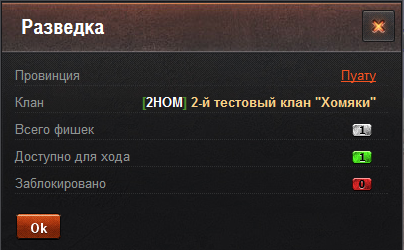 Notice that you receive information about the number of enemy troops on the province you are attacking. This information is displayed in the center of the information block of the province. This arrow points to the enemy province from which you will be attacked from. You can counter attack the troops attacking your province with the troops on the defending province. For this select the province being attacked which has troops and attack the province from which you are being attacked. In this situation remember that you become the initiator of this counter battle. Counter attacks are between two attackers on the same province border, that is, two troop groups going towards each other. The rest of the troop, deployed on the territory of these provinces, but not participating in the attack, do not participate in the battle. The number of your and the enemy troops involved in the battle initiated by you or the enemy in a counter attack is also displayed in in the list of attackers in the information panel of the enemy. Counter attacks are marked with a special symbol. Counter attacks are always conducted at the same time, after half hour after the start of prime time of the province. In a result of a draw in a counter attack the result is counted as a loss for both teams. Tokens that lost such a battle are moved from the map into the clan reserves. Tokens that won such a battle continue to battle for the enemy province in the usual way, that occurs 1.5 hours after the beginning of prime-time. If a territory is being attacked by another clan, you can still mount an assault on it following the usual rules. For a province being attacked by more than one clan a series of battles is scheduled. The first battle between the owner of a province and one of the attackers is schedules one and a half-hour after prime-time. The next battle will be held between another attacker and victor of the first battle half-hour after the the first battle. Then the next attacker battles the last victor, etc. The victor and the holder of the province is the clan that held the victory in the last battle of the series. The order of attacking clans is made randomly. The province is transfered to the new owner at the beginning of the next turn after the last battle. If the enemy took over a province that held your headquarters, the headquarters are removed from the map for 24 turns. In the course of this time you will not be able to deploy tokens from the active reserve. After the duration of 24 turns you will be able to again place your headquarters on any province under your control, with the help of the same button button that allows you to move your headquarters. Again moving your headquarters will be unavailable for the next 24 turns after being placed, but deploying troops will be available the next turn after placing it. 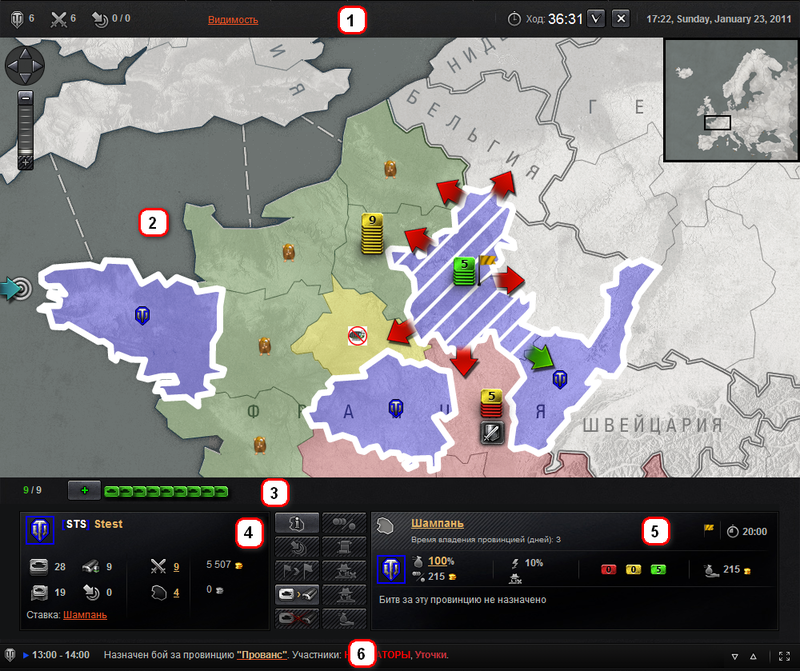 Game rules allow for a payed option to "Carry out an espionage operation". With its help you can find out how many tokens are located on the enemy province at the beginning of the next turn, and if the headquarters are located there at the same time. Carrying out espionage missions is not allowed on a territory being already attacked by your troops. To carry out espionage you must select a province belonging to another clan and press the button . In that case if the operation was successful from your account will be withdrawn an amount of 500 units of game gold, and on the screen will be displayed information window with the results of the operation. If the operation was unsuccessful then the payment for it is not taken. You cannot carry out a second espionage mission on the same province in the course of a game day regardless of whether it was successful or not. Every province under the clan's control brings it an income in the form of gold. The amount of income from each province is displayed in the province information window regardless of who the province currently belongs to. At the beginning of every turn an 1/24th of the day income from every province under the clan's control is given to the clan. Any battle not started in the frame of the starting tournament battle will be moved to the next game day. For all other battles it will count as a technical draw. Tokens removed from the map from such a draw will be made available for redeployment on the map immediately. Dernière modification de cette page le 24 octobre 2015 à 18:15.